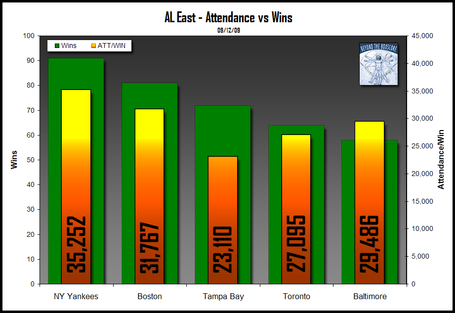 Over on Beyond the Box Score, Justin Bopp has treated us to a graphical analysis of attendance at major league baseball stadiums. Beyond the Box Score is a blog about baseball that follows the SABR (Society for American Baseball Research) tradition, which involves intensive statistical analysis. About the time physicists refine their Theory of Everything, the Sabermetricians will have derived a Statistic of Everything that will replace batting average, RBI, ERA, and fielding percentage. I like to keep an eye on baseball, so I’m glad I’ve found Justin’s informative and entertaining blog. Justin’s analyses use some awkward charts and he introduces an awkward statistic. The charts are dark, and the colors and gradients bold, so the charts weigh heavy on the eyes. 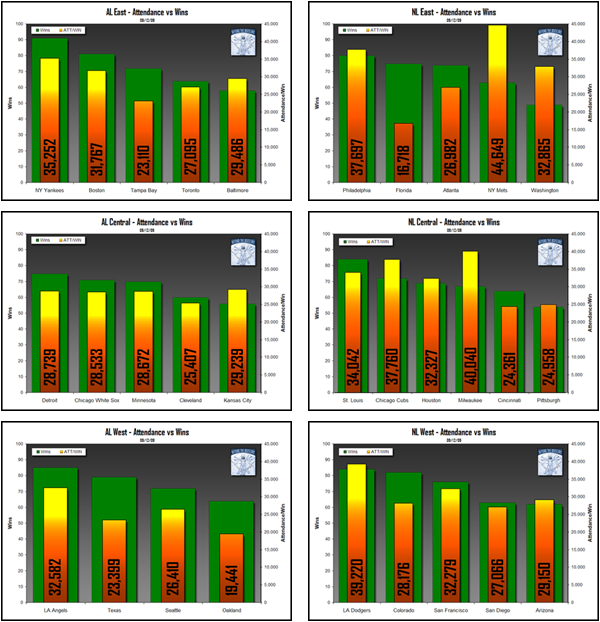 There are only twelve data points per chart, six on each axis, and part of the analysis involves comparing the relative heights of the bars on primary and secondary axes. I’ve discussed the problems of comparing series on primary and secondary axes in Secondary Axes in Charts. Any conclusions you may reach are affected by the relative arbitrary scales on the primary and secondary axes. It’s not easy to make comparisons among these charts, and you miss the opportunity to see how attendance and number of wins are correlated. 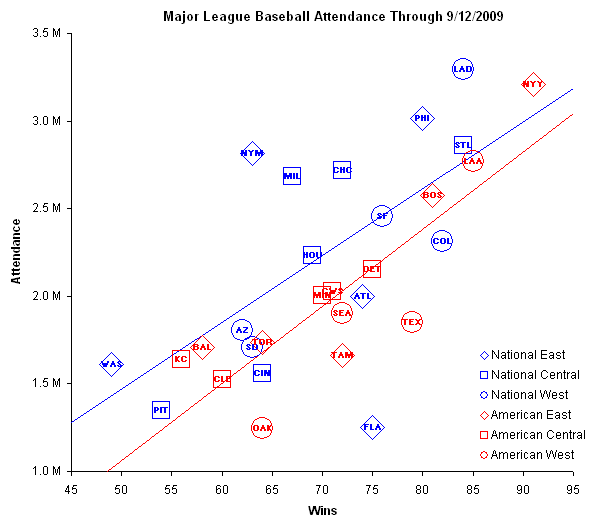 In fact, you don’t even see attendance in these charts: Justin has introduced a statistic called Attendance Per Win, which he is comparing to the team’s wins. 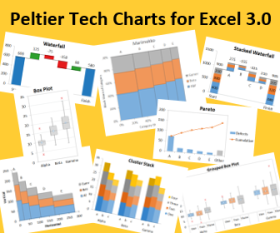 Rather than plot the two variables of interest on primary and secondary columns, Chart Busters have made an XY chart (or as statisticians and Microsoft call it, a scatter chart). 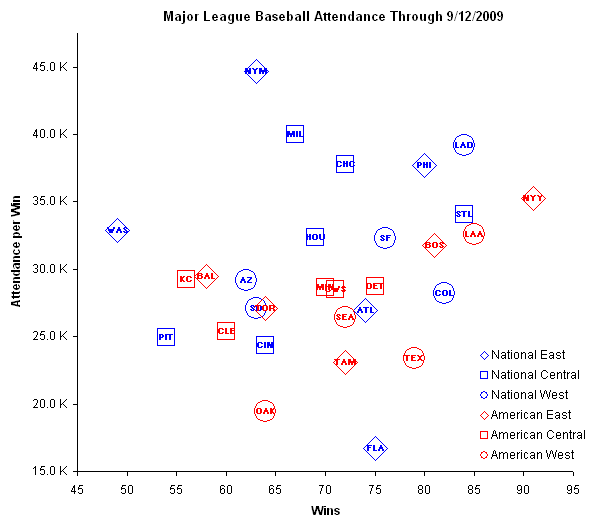 All three divisions of both leagues fit onto the chart, which shows wins on the X axis and attendance along the Y axis. The teams are denoted by the data labels, and we only have one case of overlapping, the red squares for the Minnesota Twins and the Chicago White Sox, in the middle of the chart. 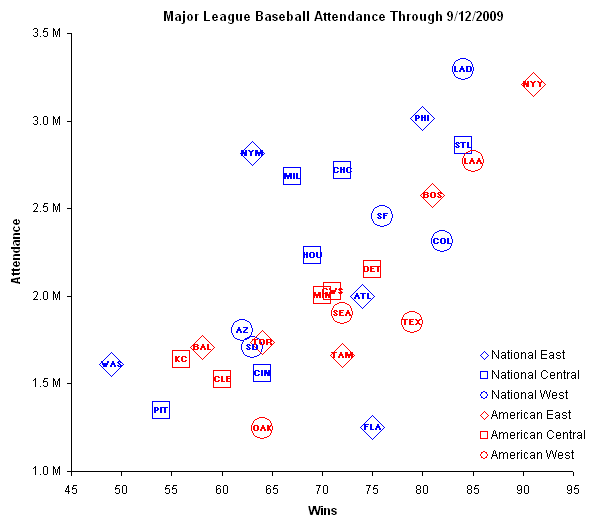 There is an obvious positive correlation between wins and attendance: makes sense, because teams love to cheer for a winner. Justin’s use of the derived Attendance Per Win statistic initially makes some sense. But when Chart Busters replace the Y axis of the XY chart with Attendance Per Win, we lose the clear correlation. The National League looks purely random, while the American League has at best a slight positive trend. Justin’s intent was to show which teams gain more attendance than expected for the number of wins. Without inventing a new statistic, Chart Busters show this by simply drawing the lines of best fit. There are separate lines for each league, since there’s some difference in average attendance between leagues. 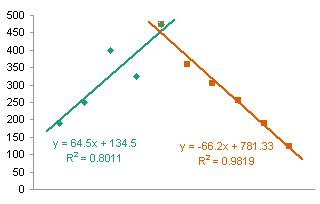 Linear regression supports our eyeballs: there is a positive correlation for each league. R² for the American League is 74%, and for the National League is 39%. Not a bad correlation, since it ignores such factors as weather, stadium size, and scheduling variations. The points Justin makes are visible in this chart: fans in Florida, Oakland, Texas, and Tampa do not support their teams, as shown by the distance of these points below the fitted lines. In fact, Florida has abysmal fan support. The Mets, in contrast, have the strongest fan support. This in conjunction with their sub-mediocre win total shows that my previous statement, that fans love to see a winner, is not strictly true. The Brewers, Cubs, Phillies, and Dodgers also have stronger than expected fan support, but then, the Dodgers and Phillies are leading their respective divisions. Let’s see how Justin’s Attendance Per Win stands up to best fits. The American League shows a positive correlation, not very steep, and the National League has only a very slight positive slope. The R² values are 23% for the AL and 2% for the NL. We see the same teams with strong and weak fan support as in the previous chart, without clouding the analysis with an unnecessary derived statistic. Posted: Tuesday, September 15th, 2009 under Chart Busters. I’ve written a bit about regression and curve fitting; see Regression Approach to a Simple Physics Problem, Choosing a Trendline Type, and Trendline Fitting Errors. A blog reader asked for help with some sample data that he couldn’t fit. Here is the data. I plotted the data and gave it the hairy eyeball. Not a linear trend, maybe something quadratic. 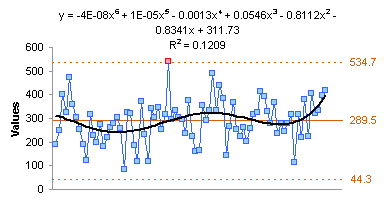 The blog reader had fitted a 6th order polynomial trendline, and was having trouble using it to predict values. My fit is shown below, and I had no such problems with predictions matching the trendline. I suspect the user had insufficient precision in his coefficients, which is covered in Trendline Fitting Errors. The 6th order fit isn’t really all that great. I decided it really isn’t much better than the quadratic fit I had initially suspected. Then I thought the data almost fit two line segments over different ranges of data. I’ve plotted these below. I replied to the user with this suggestion, and he said that wouldn’t work, because the data would have to be fitted with many line segments, because the data he gave me was only part of a much larger sequence of values. I thought a moment and realized that with many weeks of repeated data, what the user needed was an approach based on Statistical Process Control. 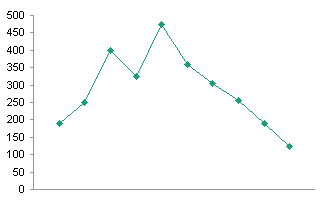 I wrote about Control charts in Introducing Control Charts (Run Charts). This is an opportunity to illustrate another set of run charts. In this example, I relied on techniques from a small, 136-page book called Understanding Variation . I added a column to my table to calculate the Moving Range, which is simply the absolute value of the difference between the current value and the previous value. This is an easier measure of variation to compute than the standard deviation, though with modern computer hardware and software that’s not an important consideration. 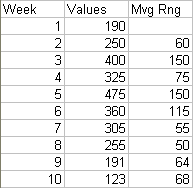 In any case, I plotted the weekly values data and the moving range data. I computed the averages of the values data and of the moving ranges. I added horizontal lines to indicate the averages (see Run Chart with Mean and Standard Deviation Lines for detailed instructions). What this tells me is that the values and the moving ranges fall within limits, so the variability is given not by anything we can fit a curve to, but simply by normal variation within the process. Closer examination of some of the data would probably point to an out-of-control process (for example, the last five values show continuing decline). Let’s just worry about violations of the control limits. I calculated 70 more values with the same mean and standard deviation as the original 10 values, to simulate an ongoing process (because the blog reader did not provide more data). I plotted these values on the same chart with the original ten values, using the limits calculated based on the original ten values. The values look pretty good, all within the limit except for a single point, which should be examined for any special causes of variation. All of the moving range points fall within the upper control limit. I recalculated the averages and limits using the entire data set and replotted the data. There was little difference; the limits were slightly more generous. The value that exceeded the control limit in the first chart of all the data still is out of control, and still deserves a closer look. One final note: The polynomial regression breaks down completely in a process like this which is successfully modeled using SPC. 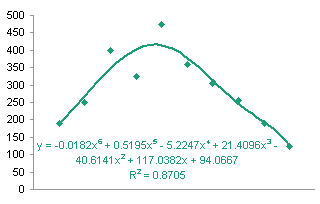 A linear fit may be useful to detect a possible trend of the average over time. Posted: Tuesday, October 7th, 2008 under Statistics. Tags: control chart, Formatting, Run Chart, Statistical Process Control, Statistics, Trendlines. In Graphical Approach to a Simple Physics Problem I discussed my daughter’s physics homework. The problem was to determine the relationships between how long it takes water to drain from a hole in the bottom of a bucket, the diameter of this hole, and the initial height of water in the bucket. 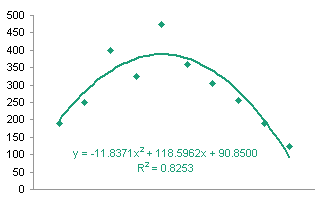 Given this relationship, the time to drain an initial height of 20 through a hole of diameter 4 was to be computed. The data is shown in this table. Posted: Wednesday, September 10th, 2008 under Data Techniques. Tags: Physics, Regression, Science & Engineering, Statistics, Trendlines. There has been a lot of discussion about pie charts and bar charts lately. I and many other know-it-alls have clearly stated that pie charts are the red-headed stepchildren in the family of chart types. In Peltier Loves Pie I provided some guidelines to follow if you still insist on using pie charts. In this post I am giving bar charts equal time. Posted: Monday, July 14th, 2008 under Chart Types. Posted: Wednesday, May 21st, 2008 under Excel 2007. Tags: Excel 2007, Statistics, Trendlines.